There were 524 press releases posted in the last 24 hours and 153,491 in the last 365 days. NEW YORK, NEW YORK, UNITED STATES, July 6, 2018 /EINPresswire.com/ -- Fine poetry is the music of mathematics. Even when translated into other languages, it retains its precision, beauty and timelessness. 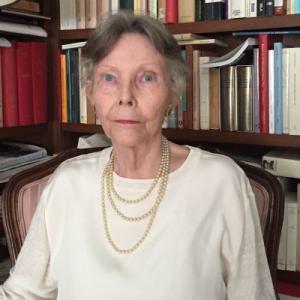 Anne Lake Prescott is the Helen Goodhart Altschul Professor of English emeritus and Senior Scholar.at Barnard College and Columbia University where she has dedicated her career to the study of the English and French Renaissance and the exchange of ideas between the two movements. Dr. Prescott is the author of French Poets and the English Renaissance: Studies in Fame and Transformation, many articles on Renaissance literature, and ten contributions to The Spenser Encyclopedia. Now 82, Dr. Prescott says she’s nearing the end of her career, leaving behind a legacy of scholarship and a commitment to preserving the achievements of the past. Dr. Prescott’s tenure coincided with the famous Columbia University protests of 1968. Still, Dr. Prescott had reservations. As former president of the John Donne Society, the Edmund Spenser Society and the Sixteenth Century Society, Dr. Prescott holds a deep affection for poetry and the literary tradition. But, Dr. Prescott says she was wrong about the future. Far from disappearing, Dr. Prescott’s computer keeps her in touch with John Donne scholars and French Renaissance scholars all over the world. CUTV News Radio will feature Anne Lake Prescott in an interview with Doug Llewelyn on July 10th at 11am EDT.